"I value living independently in my own home, with my own front door, feeling protected and secure, knowing that I only need to step outside that front door and I am surrounded by friends. " 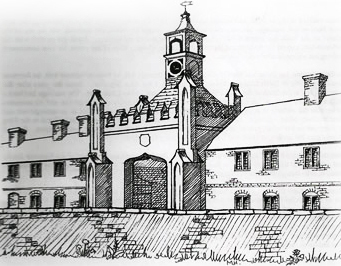 The Duchess of Somerset’s Hospital was endowed in 1686 under the Will of Sarah, Duchess of Somerset (1631-1692). Sarah, nee Alston, was a great benefactress of the period. She was first married to George Grimston and had two sons (who died in infancy) and then she was widowed at the age of 34. She then married Lord John Seymour, who later became the 4th Duke of Somerset . The Duke died in 1675 leaving 43 year old Sarah a widow for the second time. Sarah kept her title even though she later married Lord Coleraine and lived in this area of Wiltshire. From a very early age Sarah saw at first hand the aftermath of the Civil War and became increasingly aware of poverty, the neglect of the elderly and the lack of education of the young who were striving to earn an honest living. It is within this context that she endeavoured to help those around her. She did not wait to become old and ill to plan her Will, but she made plans for several generous endowments to schools and hospitals. In her Will of 1686, she bequeathed a substantial sum for the building of a hospital and chapel in Froxfield for 30 poor widows from Wiltshire, Somerset and Berkshire, one third of whom were to be clergy widows. Sarah’s personal touch was to make a provision for each widow to receive a new cloth gown at Christmas, the cost of which was not to exceed 26 shillings and 8 pennies. She also made provision for the leases on the properties to be raised in order to provide investments for further accommodation to be built. Less of a hospital and more a place of solace, refuge and re-education in life, this group of houses came to be called ‘The Collegiate’. To this day it is referred to fondly by residents and locals as ‘The College’. A curate was also to be appointed who would receive a salary of £10 per annum for reading daily prayers, to preach on Sundays and visit the sick. The original chapel was built in the north west corner of the quadrangle but by 1813 this was so dilapidated that the Duchess’ descendant, the Earl of Ailesbury, took responsibility for erecting the ‘gothic’ style chapel sited in the centre of the quadrangle today. The Duchess of Somerset’s Hospital is a Registered Charity for Sheltered Accommodation for Women.